Bar-i’s liquor inventory services provide a unique benefit that differentiates us from many of the other systems on the market. Our system compares what was rung vs. what was poured in order to tell you how much of every product is missing. This data can help you take the steps necessary to improve staff accountability in order to ensure everything poured is being properly rung into your POS. Ultimately, this will help you lower your liquor cost and maximize profits. In order for our bar inventory system to accurately identify how much of every product is missing, it’s crucial that your POS system is set up properly. At Bar-i, we perform hundreds of inventory audits each month, and our system currently integrates with over 20 different POS systems. 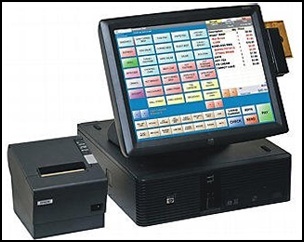 Based on this vast experience working with different POS systems, we’ve determined that programming your POS system properly is much more important to the success of your bar than the specific system you use. One of the most effective ways to objectively measure the effectiveness of your POS setup is to evaluate what percentage of your overall liquor sales are rung in as “unknown liquor.” A high percentage of “unknown liquor” charges on your POS is an indication that you’re not capturing every last dollar of profit. Ideally, you should strive to have your “unknown liquor” percentage below 1% of your total bar sales entered into your POS. This simple metric will help you know whether your POS setup is being used to help drive profits. If you serve a customer a Jack Daniels, there will be 1.5 oz. of liquor in the drink. If a customer orders a Jack Daniels double, it will be a 3 oz. pour. Typically, bartenders will ring in the Jack double by going to the whiskey screen on the POS and pressing the “Jack Daniels” button, indicating a 1.5 oz. pour. Then the bartender will go to the modifier screen and press the “Double” button, which typically adds a set amount of money to the price of the drink. The challenge with using this type of modifier button is that when Bar-i sees the “Double” button on your POS report, there’s no way to know that it refers to an extra 1.5 oz. 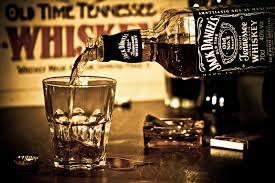 of Jack Daniels. It could’ve been used in association with any type of liquor served at your bar, and there’s no way to identify the precise liquor it was used with each time the button was pressed. This creates a problem that limits our ability to provide you with accurate data. While we know how much product was served (3 oz. ), we don’t have enough detail to identify the specific product that was being served. 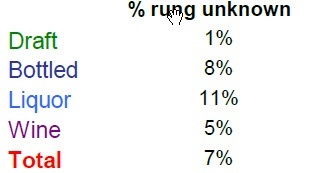 In order to keep our results accurate, we use an imaginary product called “unknown liquor” on our inventory report. Anytime a button is used that indicates the amount of product used but not the specific product used, we write those recipes using the “unknown liquor” product. In the Jack Daniels example above, when you compare the amount of Jack that was rung vs. sold during this inventory cycle, there will be a discrepancy of 1.5 oz. This 1.5 oz. discrepancy will be offset by a positive ring of 1.5 oz. of “unknown liquor.” As a result, the total amount of product served will be correct on our report, but the results will be somewhat messy because 1.5 oz. of Jack Daniels will show up as missing. If these types of modifiers are used hundreds of times during an inventory cycle, it can create a situation where it becomes very challenging to accurately track how much of every product was sold at your bar. Enables the server to indicate to the bartender what drink needs to be made – The server rings a drink into the POS system, a ticket is printed for the bartender, the bartender makes the drink and leaves it with the ticket, and the server then brings the correct drink to the customer. This function of your POS is critical to the running of your restaurant and ensures that customers always receive the drinks they’ve ordered. Charges the customer the correct amount for a drink – When your bartender rings in a Jack Daniels drink, the POS will charge the correct amount for the drink because you can set the appropriate price to charge for Jack Daniels when you set up your POS. However, when the “Double” modifier is used for a Jack double, you’re no longer able to charge the correct amount for each drink. This “Double” modifier will add a set upcharge amount for every drink that uses this modifier. As a result, well and premium liquors are being charged the exact same add-on price for a double, even though these two liquors cost significantly different amounts. This setup doesn’t effectively optimize your pricing since you’re leaving money on the table by charging the same add-on price for a premium drink as a well drink. Provides a precise record of what is sold – This function is important because it allows you to use your inventory efforts to compare how many servings of each product are poured vs. sold. In order to accurately gather this data, you need to have a precise record of what is sold. The problem in our Jack Daniels example above is that 3 oz. of product were sold, but we only know that 1.5 oz. was Jack Daniels. We have no way of knowing what the other 1.5 oz. was. Using generic modifiers such as “Double” or “Rocks” causes your POS system to perform poorly on 2 out of these 3 important functions. Your system will only be able to properly perform the function of telling the bartender what drink needs to be made. For our pro-version inventory clients, the “unknown liquor” product becomes a useful tool because it allows us to look up what percentage of their sales is rung in as “unknown liquor.” We’ve found that most bars have 5-10% of their sales volume being rung up as “unknown liquor,” which is much too high a percentage if you want to maximize profits. Programming your POS to have a separate button for each drink sold is a time consuming process, but ultimately it will yield much more effective inventory results that will help you improve accountability. Over time, this will result in higher profits for your bar. If you’d like to learn more about how Bar-i can help you improve your bar’s operations and maximize profitability, please contact us today to schedule a free consultation. We serve clients nationwide from our offices in Denver, Colorado.